The Los Angeles Department of Water and Power announced its latest snowpack measurement in the Eastern Sierra Monday and it's at an encouraging 171% of what's considered normal (compared to the state reading of 153%). It's a mark that matters because much of L.A.'s water supply comes from the snow that falls on the Eastern Sierra mountains, which is is ferried south via the Los Angeles Aqueduct when it melts. Think of the L.A. Aqueduct as a giant, 233-mile-long funnel capable of holding about 365,000 acre feet of water. That's about 70% of L.A.'s overall water demand. It's not clear how much water this year's snowpack will produce, but the record snowpack in 2017 produced about one million acre feet of water. That's too much for a funnel only about one-third that size. That means that water managers have to figure out where to put the excess water as it melts off the mountains. That 2017 surplus of water? Mayor Eric Garcetti actually declared a state of emergency to deal with it the historic 241% of normal at the time of his declaration, the most snow recorded since the Aqueduct was constructed in 1913. Later in the season the snowpack measured 204%, still twice as much as normal. The city spent $27 million to cope with the excess water. A similar water emergency declaration won't be needed this year, Collins said. However they will duplicate some of the tactics of 2017 to deal with excess water. More water in the aqueduct means DWP doesn't have to buy as much imported water from the Metropolitan Water District. 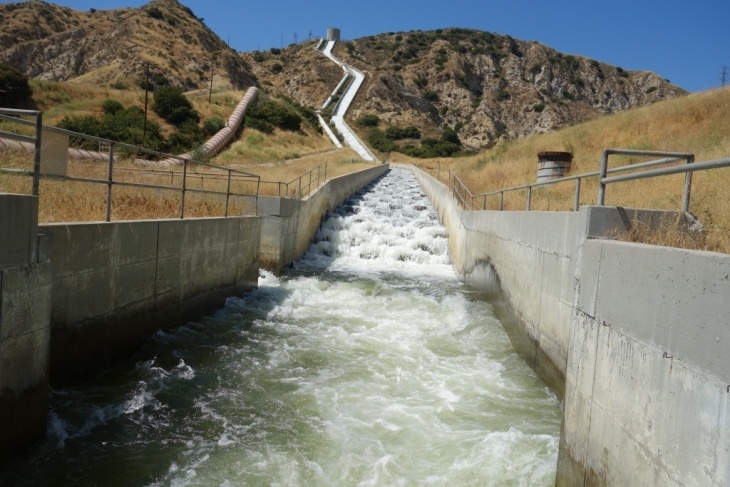 MWD has its own aqueducts that bring water from Northern California and the Colorado River. During our drought years, purchased water from MWD has made up more than half the city water supply. But in this water-rich year, 70 percent of the city's water will come from the aqueduct. That leaves only about 30% of L.A.'s city water supply coming from Metropolitan's imported supply plus groundwater, recycled water and conservation, DWP spokeswoman Ellen Cheng said. DWP's board had already set the upcoming July through December rates with the added runoff in mind, so customers will get some benefit. Correction: A previous version of this story incorrectly described the sources of non-aqueduct water that would be used in Los Angeles in the coming year.